It takes one smile to make a good first impression. But what if you have stained and chipped teeth, will a smile still lift your profile? Perhaps, no – that is why we at Allen Dentistry are here to help! Our goal is to make everyone’s dream smile turn into reality through porcelain veneers. Chips, cracks, discolorations, gaps, and mild crookedness are teeth imperfections that veneers can fix. The prostheses are made from thin, shell-like porcelain or composite, with shape and appearance that resembles the real teeth. Among the different kinds of veneers, the porcelain type is the most durable, natural-looking, and ideal. Why choose porcelain veneers? Firstly, the prostheses are resistant to stain. Those who have it in their mouths are sure to enjoy long years of a pearly-white smile! The only thing is, porcelain veneers are incapable of absorbing both stains and whitening agents. If you are planning to whiten the rest of your teeth, you might as well do it beforehand. Good news! We do not just provide porcelain veneers in Allen, TX! Instead, we also offer teeth whitening procedures. 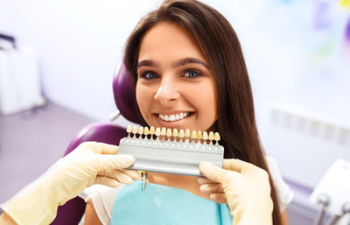 People who do not have major smile flaws and whose only aim is to whiten their pearly whites can instead opt for our bleaching treatment. Porcelain veneers will not make you feel as if something is clinging on top of your original tooth. Our dentist sees to it that the prostheses will appear and function as the real pearly whites. The color of the veneer is even customized to ensure that it will provide a natural look. Are you ready to smile with full confidence? If so, visit us at Allen Dentistry now! We are located at 551 W. McDermott Dr. Allen TX 75013. Our Porcelain Veneers in Allen, TX are all that you need.